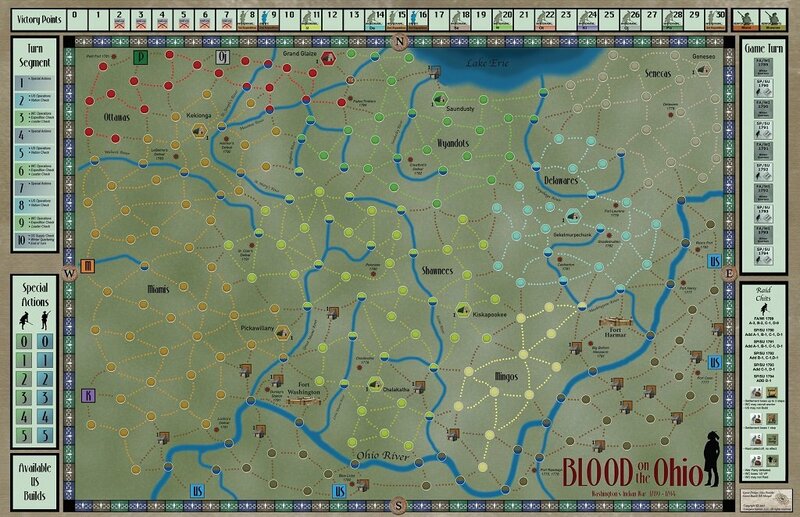 Blood on the Ohio 1789-1794 is a two player, point-to-point game loosely based on King Philip's War (MMP - 2010). 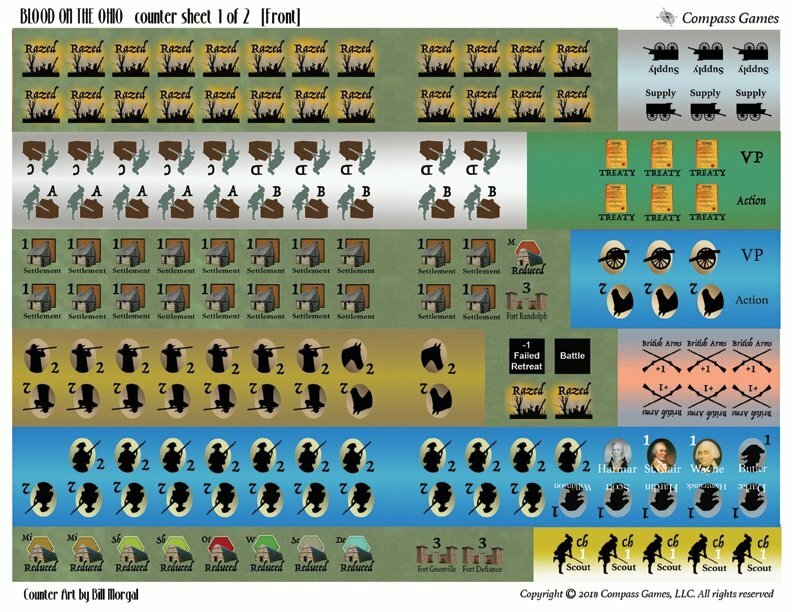 Players command US regulars and frontier militia or Indian warriors in a growing confederation of ten Indian nations. The game consists of three separate Expedition scenarios and one campaign scenario. 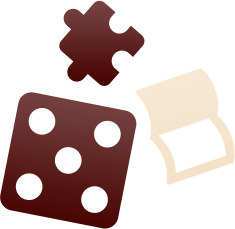 Mechanics include six month turns divided into three two month segments in which players alternate playing special actions such as building, raiding and negotiation then enter into movement and combat. Of specific interest are unique approaches to raiding, militia morale, leader tactical ratings, and a three die combat resolution. 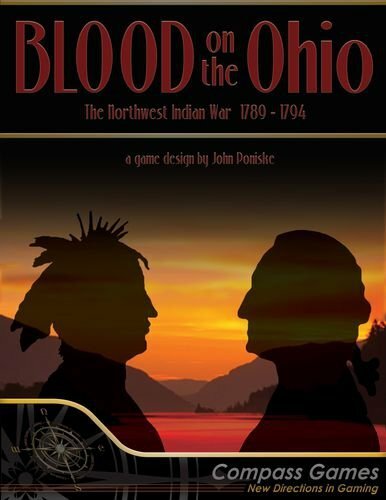 Play-testers find Blood on the Ohio tense and exciting. History: On November 4th, 1791 the United States Army suffered its greatest defeat at the hands of Native-American warriors. One thousand casualties fell in the wake of St. Clair’s defeat during what came to be known as “President Washington’s Indian War,” the “Northwest Indian War” or “Little Turtle’s War.” Before the war ended an untold number of Indians and settlers would slaughter each other in a seemingly endless series of raids and revenge killings. The conflict grew from the bitter seeds of land grabs and broken treaties. Indians west and north of the great Ohio River were frequently blamed for raids on peaceful settlers and white hunting bands but such attacks were often at the hands of outraged natives who saw their promised land stolen by waves of white settlers who shot their relatives for sport. The Ohio River became the recognized boundary between the Americans and the Indian Nations in the Ohio territory, although bad feelings still smoldered following the French and Indian War and hard on its heels, the American Revolutionary War. In both cases, Indians were encouraged to take sides but wound up the losers regardless of whose side they took. The revenge-minded perpetuated violence while peaceful folk on both sides suffered their depredations. Among such incidents is the tale of Mingo chief John Logan who advocated cooperation until treacherous frontiersmen, guests in his own home, slaughtered his entire family. Consequently Logan went on a long series of murderous raids, igniting Lord Dunmore’s War just prior to our War for Independence. Following a series of Indian raids into Ohio and Kentucky settlements in 1789, Brigadier General Josiah Harmar led an expedition up the Great Miami River where he destroyed five Indian villages. Unfortunately he was trapped there and sustained 27% casualties forcing him to retire. Washington ordered a second expedition later that year led by the commanding general of the US army, General Arthur St. Clair. His ignominious defeat at the headwaters of the Wabash River led Washington to replace him with Revolutionary War hero, General “Mad” Anthony Wayne. Over the next few years a loose confederation of Nations headed by the Shawnee and Miami Nations under the leadership of Little Turtle, Blue Jacket and Buckongahelas (of the Delawares) held further U.S. expansion in check. Furious over U.S. failures, Washington ordered Wayne to enlarge the regular army and lead a third expedition to defeat the Indian confederation once and for all. He did this in the summer of 1794 at the battle of Fallen Timbers.